Facebook preferred not to report further details about the dark mode on Facebook Messenger, explaining that it was only a small test. 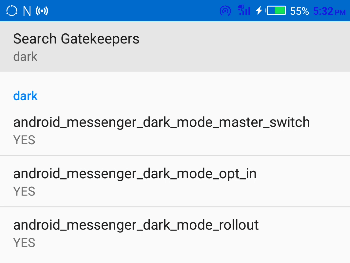 A few hours ago however, on Reddit has been published a method to enable the dark mode on every smartphone and in every country where the application is usable. There are two requirements. Requires that you have root permissions enabled on your smartphone, the latter requires the latest beta version of Facebook Messenger installed on your smartphone. First, you need to uninstall Messenger on your device. Now install the beta version of Facebook Messenger. You can either sign up for the official FB Messenger beta program on Google Play, or download a copy of the beta version APK. Launch the beta Messenger app to go through the set-up wizard. Then close it. Next, install a terminal program if you do not already have one. Termux and Terminal Emulator are great choices. This will launch a secret menu. At the top under “Search Gatekeepers”, type ‘dark’. Now click each result to change them to “Yes”, as pictured in our screenshot. Close the menu, and re-launch FB Messenger. 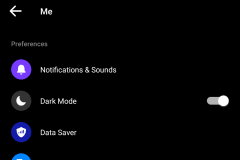 If you comply with the above requirements, you can enable dark mode on Facebook Messenger.